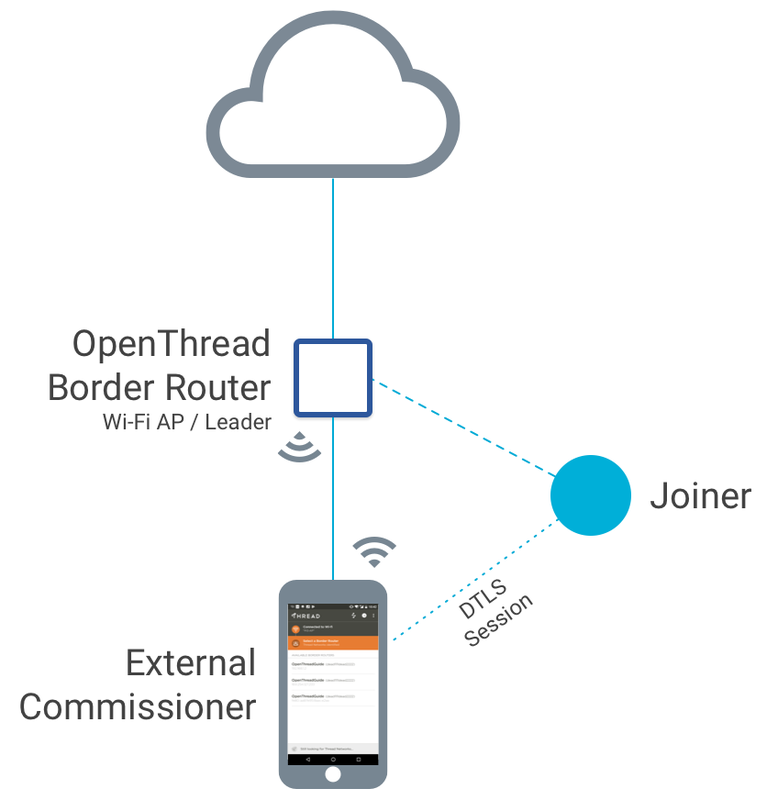 OpenThread Border Router (OTBR) features a Thread Border Agent, which supports external Thread Commissioning. In external Thread Commissioning, a device outside of the Thread network (for example, a mobile phone) commissions new devices onto the network. The Thread Commissioner serves to authenticate a user (external Commissioner) or a Thread device onto the Thread network. After authentication, the Commissioner instructs the Border Router to transfer Thread network credentials, such as the master key, to the device directly. This is an example of in-band commissioning, where Thread network credentials are transferred between devices over the radio. Key Point: During commissioning, the Thread Commissioner never gains possession of the network master key. This guide details how to use the Thread Commissioning App to commission an OpenThread device onto a network created and managed by the OTBR Web GUI. To learn how to commission without an external Commissioner, see Thread Commissioning. The recommended way to form a Thread network is via the OTBR Web GUI. When doing so, change all the default values on the Form menu option, except for the On-Mesh Prefix. Make note of the Passphrase used. This passphrase is the Commissioner Credential and is used (along with the Extended PAN ID and Network Name) to generate the Pre-Shared Key for the Commissioner (PSKc). The PSKc is needed to authenticate the Thread Commissioner (the external device) to the network. The Thread network can also be formed manually on the command line of the OTBR NCP, using wpanctl. sudo wpanctl config-gateway -d "fd11:22::"
Forming WPAN "OpenThreadGuide" as node type "router"
"NCP:Version" => "OPENTHREAD/g95f744fb-dirty; NRF52840; Oct 12 2017 09:24:19"
"fd11:22::              prefix_len:64   origin:user     stable:yes flags:0x33 [on-mesh:1 def-route:1 config:0 dhcp:0 slaac:1 pref:1 prio:med]"
Build and flash a device with OpenThread, to function as the Joiner. For an overview of building OpenThread, see the Building Guide. Enable the Joiner role for the build. Use the --enable-joiner configuration flag or the JOINER=1 build switch, depending on the build mode. External commissioning is supported by the Thread Commissioning App, available for download on the Google Play Store for Android devices. Note: The Thread Commissioning App is only available on Android. 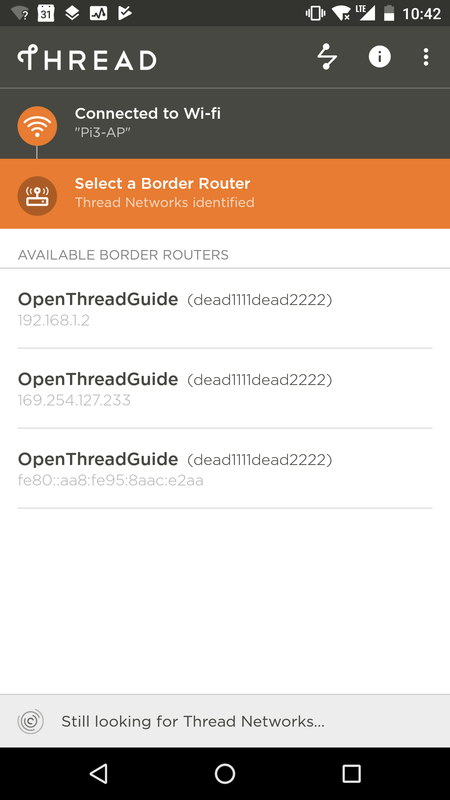 Connect the device with the Thread Commissioning App to the Wi-Fi access point on the Border Router. Open the Thread Commissioning App and select the desired Border Router from the available list. The name is the same as the Thread network created by the OTBR Web GUI. If the same Border Router shows up multiple times with different IPv4 and IPv6 addresses, select the one with the static IPv4 address used for the Wi-Fi access point setup. Enter the Passphrase (Commissioner Credential) set in the OTBR Web GUI (and used to generate the PSKc) when prompted for a password. Once connected to the Border Router, the app provides the option to scan a Connect QR Code or enter a Join Passphrase manually. The Join Passphrase is also called the Joiner Credential, and is used (along with the Extended PAN ID and Network Name) to generate the Pre-Shared Key for the Device (PSKd). The PSKd is then used to authenticate a device during Thread Commissioning. The Joiner Credential should be unique to each device. Where eui is the Joiner device's EUI64 value and cc is the Joiner Credential. Use this text string with an online QR Code generator to create a QR Code for scanning. In the Thread Commissioning App, scan the Connect QR Code of the Joiner device, or enter the EUI64 and Joiner Credential manually. This generates the PSKd, propagates the steering data through the Thread network, and establishes a DTLS session. 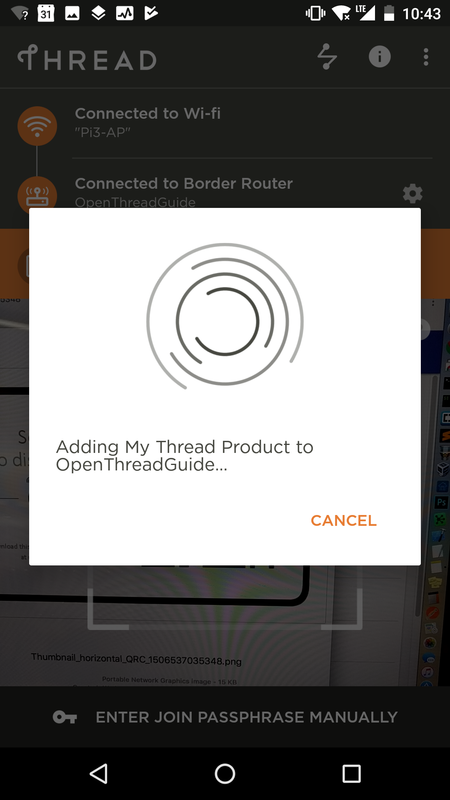 The Thread Commissioning App also updates with an "Added My Thread Product" confirmation message. The Joiner has obtained the Thread network credentials, and can now join the network. On the Joiner device, start the Thread protocol to automatically join the network. Check the state after a few moments to confirm. It may initially start as a child, but within two minutes it should upgrade to a router. Also check the device's IPv6 addresses. It should have a Global address using the On-Mesh Prefix specified during formation of the Thread network through the OTBR Web GUI. Test the connectivity between the Joiner device in the Thread network and the external internet by pinging a public IPv4 address. If NAT64 was set up as detailed in Wi-Fi Access Point Setup for OpenThread Border Router, use the prefix value configured there, combined with the translated IPv4 address. For example, the Well-Known Prefix of 64:ff9b::/96 and an IPv4 address of 8.8.8.8 combine to form an IPv6 address of 64:ff9b::808:808. You may encounter issues with the Thread Commissioning App, due to changed or stale network information. The app retains OTBR network information locally and does not always prompt for updates. To resolve these issues, delete all local application data, restart the app, and try the commissioning process again.